Designed specifically for cook-chill applications as it can be covered with heat seal film or snap-on cover. Eight trays efficiently fit on a standard sheet pan or in an 18" x 26" wire rack. 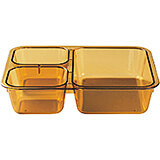 Available in three compartment insert tray only. 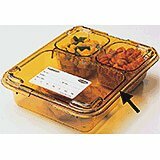 Snap-on cover fits securely insert trays for tray on tray meal delivery systems. Textured to resist scratching. Designed to accommodate extreme temperatures ranging from -40°F to +300°F. Perfect for steam table applications. Great for flash freezing, cooking and reconstitution. Case of 24, not sold individually.